I'm thinking to buy an IPhone Xs Max but it looks like it may just be a little large for the wireless charging crdle in the Q5. I think it may lift slightly at an angle and not sure then if the phone will charge. Has anyone tried? 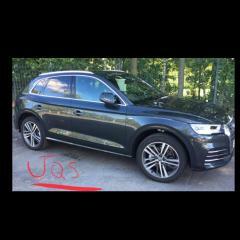 Audi Model:(17 plate) Generation II Q5 S-line, 2.0l diesel 190bhp, Monsoon Grey with black leather diamond stitched seats, electric adjust and lumber support front heated seat & rear seat plus (slide forward for more boot space). Tech Advance Pack, Navigation Plus, MMI Plus, Cruise Control, high beam assist, front & rear parking sensors. Advanced Key Entry, 20’ Rims, hill hold assist, folding & heated memory mirrors, Panoramic Sunroof, B&O 3D sound system & some extra add ons after purchase - Autoglym lifeshine on interior & bodywork, Vodafone Cat6 tracker, front and rear nextbase cameras, Audi 4 ring door puddle LED’s. The XS only just fits. XS max would not fit. The iPhone XS Max does charge in the Q5, if you have a big bulky case on it, it will not charge. I have a Mous case on my phone and I found that the top of the phone needs to be on the passenger side, and then make sure with a light press the phone make the connection so it charges. Can you take a pic of the XS max phonecase sitting in the phone box so we can see how well it fits? i have the XS and XR but didn’t go for XS-Max because I believed it wouldn’t fit.